With a move to show Turkey's continued support to Azerbaijan, Turkish President Recep Tayyip Erdoğan paid a twoday official visit to Azerbaijan upon the invitation of Azeri President İlham Aliyev as the second visit abroad as president. Speaking to the press ahead of his Azerbaijan visit, Erdoğan said that the two leaders will hold talks regarding the latest regional and international developments concerning both Turkey and Azerbaijan along with further opportunities for cooperation between the countries. Erdoğan pointed out that during his visit, the leaders will compare notes over the Nagora-Karabakh issue under the scope of Azerbaijan's indivisible integrity. Erdoğan noted that the leaders will touch on the joint investments between Azerbaijan and Turkey during his visit. Echoing that he will head towards the NATO summit to be held on Sept. 5-6 in Wales after his Azerbaijan visit, Erdoğan said that he will draw attention to the Russia-Ukraine crisis and the latest developments on Turkish borders at the summit. A statement issued on the presidential website read, "Our President's [Erdoğan] visit is a great opportunity to further the exemplary Turkey-Azerbaijan relations based on history, humanitarian ties and common interest." 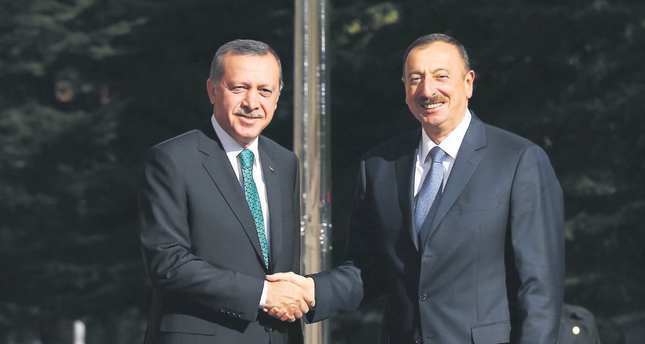 Speaking to Anadolu Agency (AA), when Erdoğan headed toward the country, New Azerbaijan Party (YAP) Deputy Chairman Siyavuş Novruzov said that Erdoğan's visit would reinforce the Turkish-Azerbaijani brotherhood. Highlighting that the visit is a message to the entire world regarding Turkey-Azerbaijan relations, Novruzov said, "No one can spoil our [Turkey-Azerbaijan] relations. "He added that significant evaluations over regional issues concerning the countries will be held during the meeting. The non-parliamentary opposition Equality Party leader İsa Gamber said that Erdoğan's visit to Azerbaijan as the first directly elected president is significant. Gamber emphasized that Turkey-Azerbaijan relations are important to both countries and to the stability of the region. "Both Azerbaijan and other countries in the region are concerned over the crisis between Russia and Ukraine. There is conflict in the Middle East. That is why Turkey and Azerbaijan's strategic alliance is of vital importance.I think important decisions will be made for cooperation." In April, as a Turkish political tradition, Erdoğan visited Azerbaijan right after the March 30 local elections resulted in a decisive victory for his Justice and Development Party (AK Party). During the visit, Erdoğan and Aliyev reiterated their commitment to the Trans-Anatolia natural gas pipeline project (TANAP), which aims to fulfill both Turkey and Europe's energy needs. The leaders said they are aiming to begin the building of the pipeline by the end of the year and start transporting gas by 2018. Emphasizing the significance of TANAP, Erdoğan said Turkey is doing its share in the project and is launching the expropriation program of the fields through which the pipeline will pass. Experts say that TANAP, which is a multi-dimensional project, has much significance for Turkey and Azerbaijan. Highlighting the magnitude of the project, experts note Turkey and Azerbaijan are attempting to build TANAP in a period during which governments are tightening their belts all around the world. "We will firmly preserve our attitude on the Nagorno-Karabakh issue, which we have had up to now," said Erdoğan. Meeting in Baku, the leaders discussed various topics from large joint economic investments to the Gülen Movement's harmful actions in both countries. In the meeting, Erdoğan stressed that both governments should take urgent steps to confront the movement and prevent it from spoiling cooperation between Turkey and Azerbaijan. Aliyev confirmed that the Azeri government is conducting an investigation into Gülenist structures in his country. In a press conference following the meeting, Erdoğan said that the two countries would never let anyone harm their relations. During the bilateral discussion between the two leaders, Erdoğan brought a file to the table focusing on Gülenists who infiltrated large joint projects. As sources reported, the leaders agreed to take steps against those infiltrators who could threaten the crucial and costly projects. Both leaders acknowledged their confidence in one another and the importance of close relations between Turkey and Azerbaijan. When asked about the Gülen Movement, Aliyev replied that a wide range of issues was discussed at the meeting. "We will never allow anything to harm our relations, even in the least," said Aliyev. "We stand by each other in every matter. We will support each other in both good and bad times. This is what brotherhood requires."